Shri. P.P. Chaudhary, Hon’ble Union Minister of State for Electronics and Information Technology and also Law and Justice visited Amrita University, Amritapuri Campus for the valedictory function of RAHA 2016 – Robotics and Automation for Humanitarian Applications. The Hon’ble Minister was the perfect person for this function as his only prayer to Amma was that he become more efficient in his service to society. Amma was delighted when Amma got to know that the Hon’ble Minister had dedicated his salary of many years for providing insurance cover to many poor women. The Hon’ble Minister wanted Amma’s guidance and support in taking technology to the villages so that the gap between the technological “Have’s” and “Have Not’s” be reduced. Amma discussed with him how science and technology can be taken to the villages in a practical manner without corrupting and loosing the intrinsic village culture. The Director of CSIR-CIMAP was in Amritapuri to sign an MoU (Memorandum of Understanding) with Amrita SeRVe project of the Mata Amritanandamayi Math. The MoU was signed in Amma’s presence by Dr. Anil Tripathi, the Director and Swami Jnanamritananda Puri. Farmers in the Amrita SeRVe villages will now receive guidance from CSIR-CIMAP scientists in planting medicinal and aromatic plants in their villages. CSIR-CIMAP (Council for Scientific and Industrial Research – Central Institute of Medicinal and Aromatic Plants) is one of India’s premier publically funded research institutes. Scientists from these labs work with farmers to make available to them the best varieties of planting material of mint, lemongrass, palmarosa, vetiver, metha, tulsi, geranium, etc. that have several important end-uses. These plants can also bring much better economic returns to farmers. The famers in these tribal villages own relatively large tracts of land (20-25 acres). But in absence of any experienced mentors who can guide them, giving them the right information about what to plant, what will grow well in those soils, etc. they continue to remain poor. In Chattisgargh, Ramachandra, 36, is now in the process of forming a farmers group including Patiram Boti, Dudhva Naag, Baman Podiya, Kahru and Mangal Madda to initiate the cultivation of crops that the CIMAP scientists recommend. 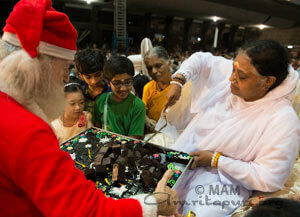 “Amma is doing more and more for our villages, we are very grateful,” he shared. Farmers in the Amrita SeRVe villages of Telengana, Gujarat and Haryana are also eager to reap the benefits of this collaboration with CSIR-CIMAP. In Telengana, 12 farmers had earlier this year planted green gram, black gram and tuvar dal totally eschewing the use of chemical pesticides and fertilizers. From the harvest, they gifted the best quality seeds to Narsanna Kopulla, a permaculture expert, who trained them. Bhagavad Gita is the essence of all the Vedas and its message is the for the entire humanity. It is the Lord’s message to the whole world, given to Arjuna as a proxy, who in the midst of adverse circumstances was completely unnerved being at a loss to discern his Dharma. In Gita we find the blend of diverse spiritual paths such as Devotion, Knowledge, Action, Yoga and it is full of spiritual principles and practices. Lord Sri Krishna came to this world to reveal the path to supreme realization to the people of varied samskaras. If only one kind of dish is available in a hotel, only those people who relish that dish will be drawn to there, whereas a hotel with variety of dishes will attract everyone. Garments of the same measurement will not suit everyone. However if costumes of different measurements are available it will serve the need of everyone. 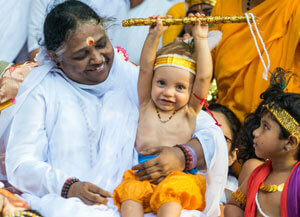 So too, Gita unfolds the diverse paths to uplift people from all walks of life to the realization of the Self. The Lord through his teachings lifts up each and every one from the plane he or she is in. The master and his words are not two. Similarly the Lord and the Gita are not different. Gita is the commentary on the life of the Lord and Lord’s life is the living commentary on the Gita. The Lord’s life was like a cool breeze that cared and awakened each and everyone and the Bhagavad Gita is like the wish fulfilling Kalpaka tree that bestows all the wishes and shelters everyone from the scorching heat of worldly existence. The purpose of learning Gita is to become Sri Krishna. Gita is the nectar that the Lord gave us churning the milky ocean of the Vedas. 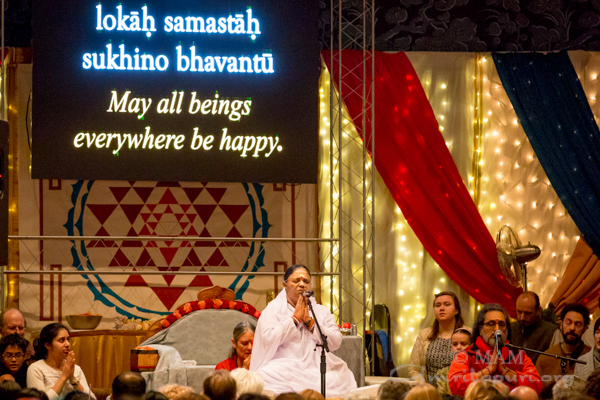 The Bhagavad Gita will continue to bless all of humanity for all times to come as the living presence of the Lord. The purpose of learning Gita is to become Sri Krishna. The Gita is not teaching us to worship a God who resides up in the sky on a golden throne, nor to strive to get into heaven after we die. Gita helps in understanding ‘How to experience peace and happiness right now, right here?’ Gita helps us to realise our true Self. There is only one thing to be said. What is everlasting, what is transitory? What is good, what is bad? 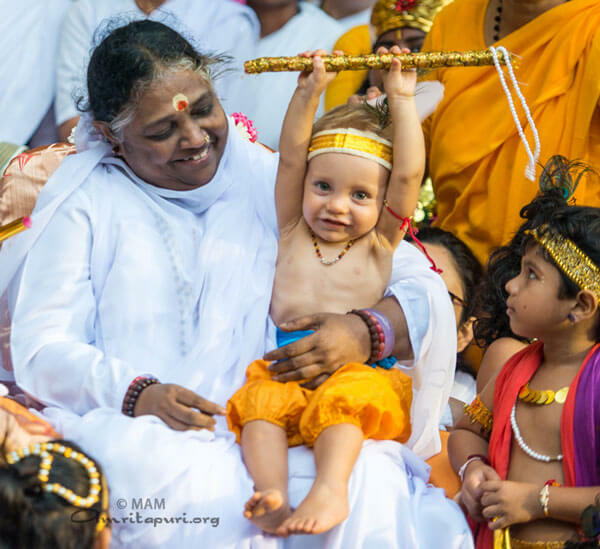 How can one realize the eternal? The Gita and the Puranas are all trying to explain these same things. The key principles are explained again and again. That is to show how important they are. If people hear them over and over again, the principles will stay in their minds. There are some apparent differences among the books, that’s all. While the Ramayana talks about the battle between Rama and Ravana, the Mahabharata talks about the war between the Kauravas and the Pandavas. The basic principle is the same. How can one hold on to the principles and move forward in the various situations that life brings? That is what all the mahatmas and all the books are trying to teach. Any spare time you have after work should be spent reading spiritual books like the Gita and the Ramayana, or the biographies of the mahatmas, or collections of their teachings, instead of going to the movies or engaging in other forms of ordinary entertainment. Don’t waste any opportunity to participate in satsangs. Share with your friends the things you hear in satsangs, thus bringing mental peace to them as well. If you are reluctant to learn Sanskrit, how will you understand our scriptures? Sanskrit is our mother-tongue. You can’t fully appreciate the Upanishads or the Gita without understanding Sanskrit. To understand the mantras and chants, you should learn them in that language. It is the language of our culture. We can’t separate the culture of India from Sanskrit. It is true that we can buy the translations of the scriptural texts in other languages, but they don’t amount to the real thing. If you want to know the taste of honey, you have to taste it by itself. If you mix it with something else, you won’t get its true taste. Even uttering Sanskrit words is good for our mental well-being. 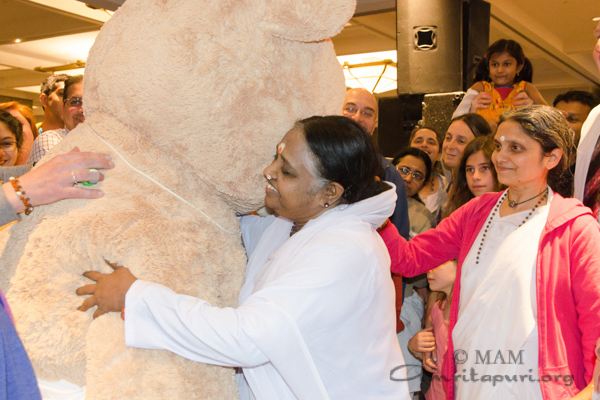 Amma arrived to the San Jose Fairmont in California for the first time Friday after the Thanksgiving Holiday to a winter wonderland – an ice skating rink and a Downtown Christmas extravaganza with twinkling lights outside and a hall packed with newcomers to experience Amma’s loving and compassionate embrace inside! There were two days of public programs and a retreat. 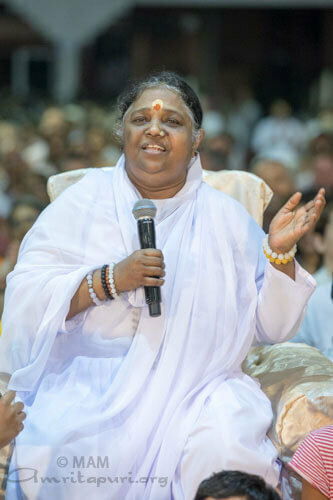 People from all walks of life were at the program on Friday and Saturday – Silicon Valley high tech crowd, Movie Stars from Los Angeles, Latinos, Indians, and Devotees from all across the United States joined Amma in San Jose. Perhaps due to the ease and accessibility of a hotel in downtown San Jose, there were many new faces who came for the first time, as well as special needs guests. Although it rained outside a few days, it was warm and festive in the hall. 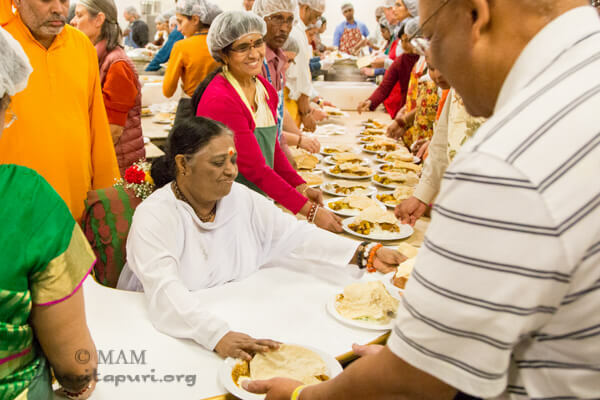 Amma was welcomed on Friday’s program by a number of social workers who help the under-privileged and needy in San Jose, and work on Mother’s Kitchen with us. 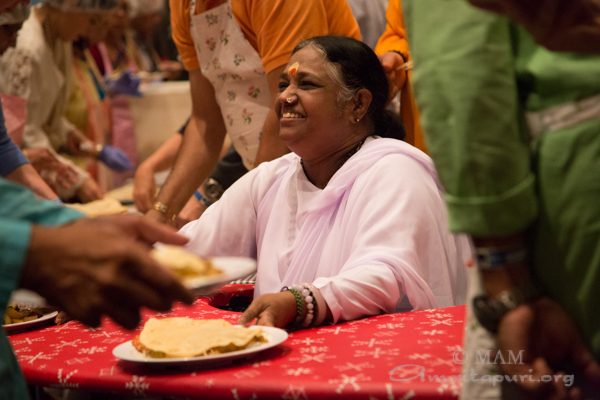 Amma’s retreat was wonderful – with people learning the IAM Meditation, satsangs, meditation, Amma serving dinner to all, and passing out delicious poppadum to the big and little children in a festive atmosphere. 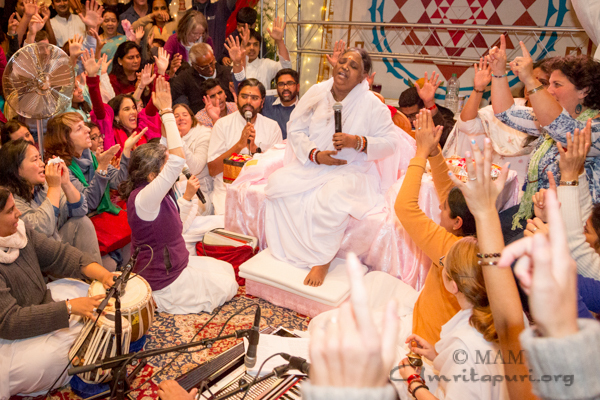 The devotees were thrilled that Amma surprised them with singing after the program one night and danced after the program another night. The energy was ecstatic as she slowly turned to the tribal music, dancing with her eyes closed as if in another world. 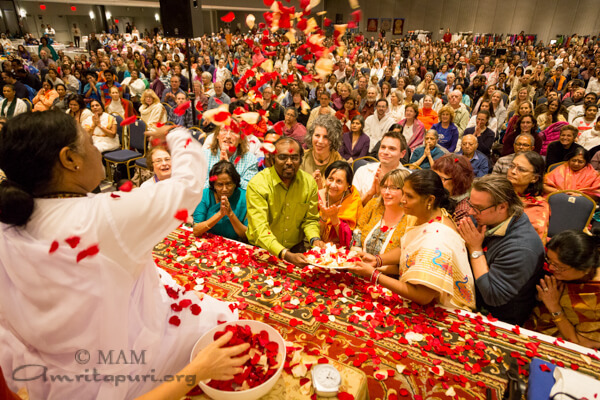 On Tuesday night, prior to Amma starting the Atman Puja for World Peace, San Jose Mayor Sam Liccardo welcomed Amma to San Jose, although he joked there were thousands of others who had beat him to it, looking around the crowded hall! Mayor Liccardo said he would be interested in working with the MA Center to do Mother’s Kitchen and collaborate on possible future projects. 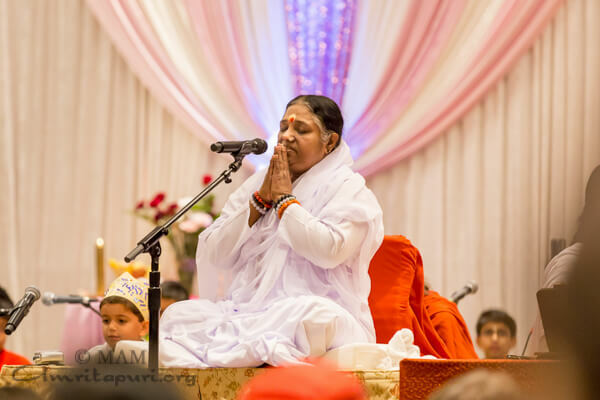 Amma visited Detroit, USA for four days of programs including a three day retreat and Devi Bhava. The programs were held at the Marriott Hotel in the iconic Renaissance Center complex along the Detroit River bordering the US and Canada. 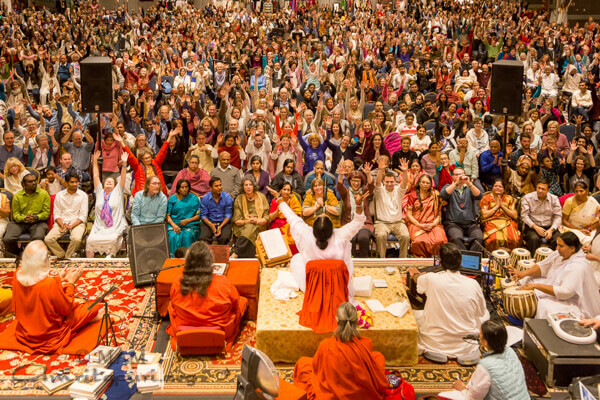 The public programs on the first day were packed with devotees from across the US and Canada. Many were on holiday for the Thanksgiving break. 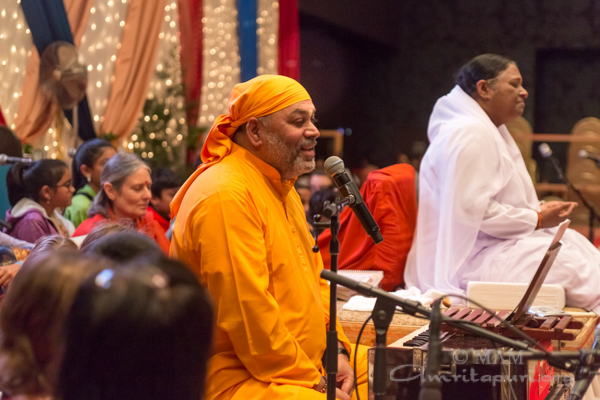 The evening public program included satsang and bhajans. 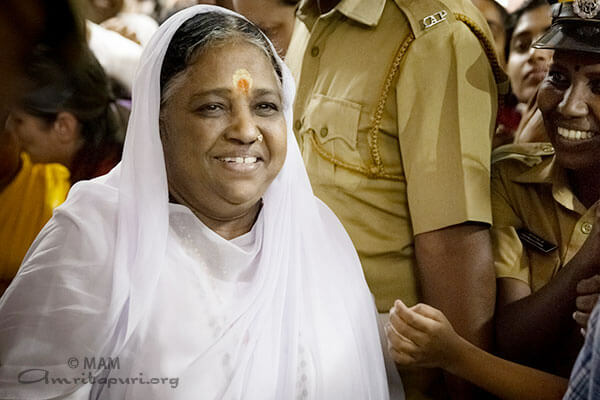 At the end of darshan, Amma stood up and gracefully danced to the traditional Baduga song. 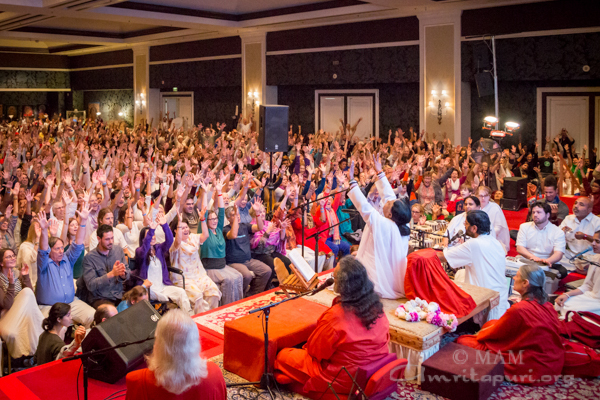 The three day retreat started on Monday with an evening program. 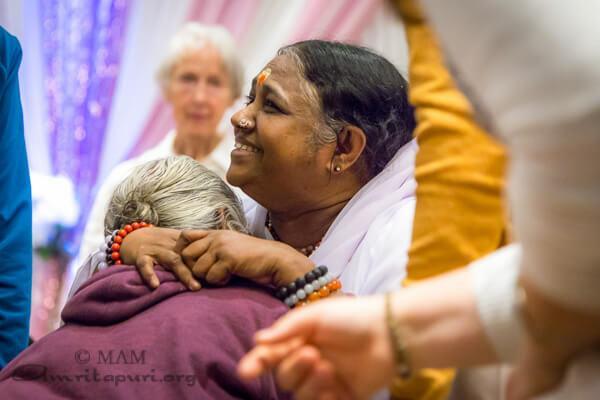 Towards the end of darshan, Amma encouraged Eknath (a young man with special needs who has known Amma for many years) to sing. He happily took the microphone and sang ‘Jingle Bells’ and ‘What a Wonderful World’ while the crowd clapped and sang along. The second night of the retreat was high-lighted by a question and answer session. 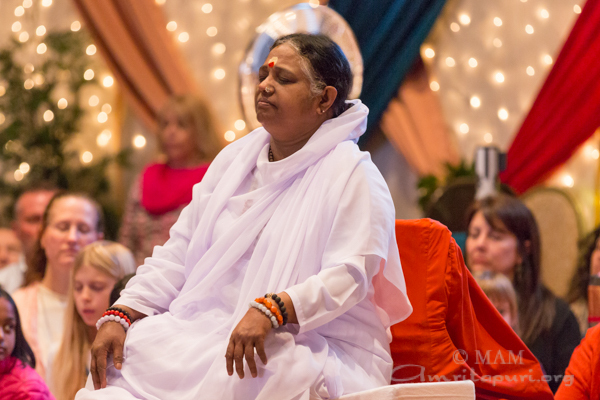 Amma then sang Hari Narayana Jaya Narayan, before heading to the dining hall to serve everyone a delicious meal. Later, cultural performances by Amma’s devotees entertained the gathered crowd. 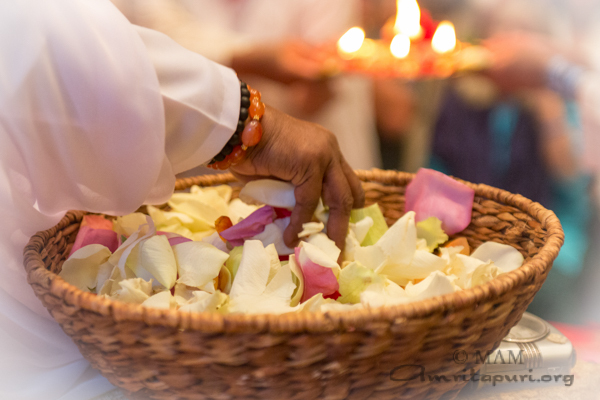 As Amma left the stage at the end of darshan, she playfully clapped peoples hands along the path. 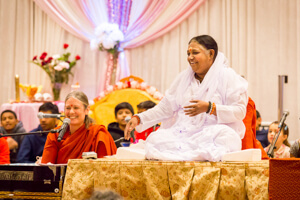 Devi Bhava was on Wednesday evening and finished early morning Thanksgiving Day. 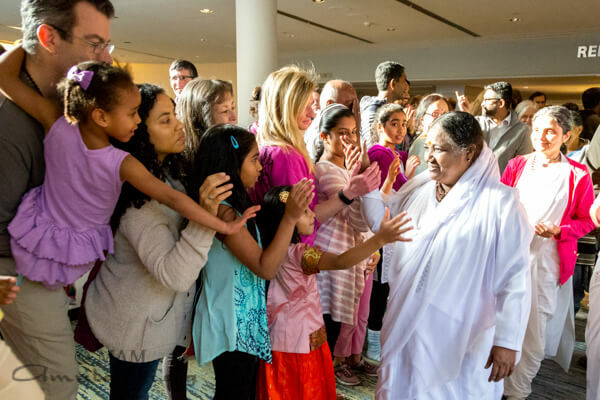 Amma then left the hall to travel to San Jose for the next stop on the November US Tour. 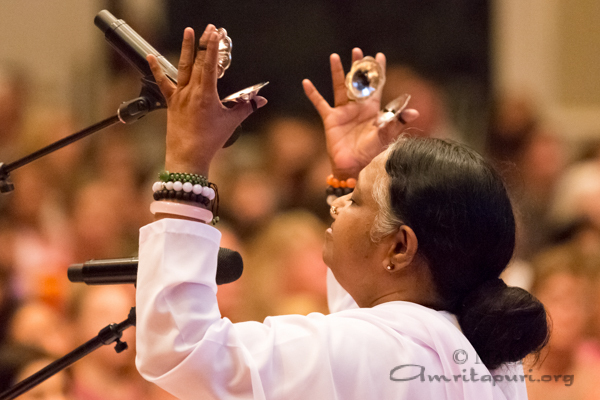 After her Europe-America Yatra 2016, Amma is back to Amritapuri by 2.00 am on the 3rd Dec. 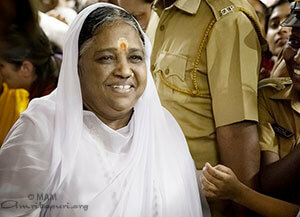 Smiling as as always, Amma waded though the Ashram residents to her room. 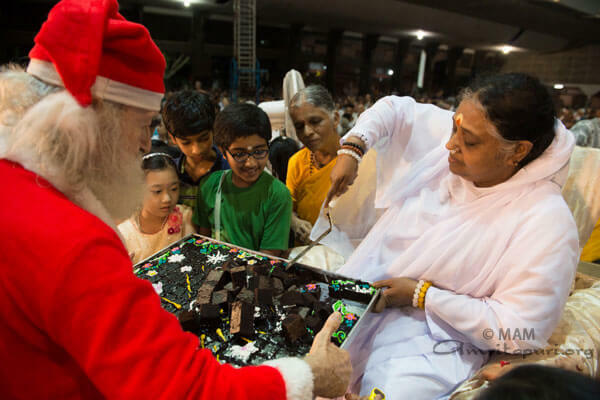 Darshan will start at the ashram from 7th Dec onwards.